Paul McCartney is a Shareholder whose practice focuses on defending nursing homes, physicians, hospitals and other healthcare providers in litigation involving claims of professional negligence related to patient care. Mr. McCartney is an experienced trial lawyer but also has experience in handling appellate issues. Mr. McCartney routinely lectures to healthcare providers on issues related to risk management and litigation. Mr. McCartney has been selected as an Ohio Super Lawyer for thirteen straight years (2006 through 2018). In 2013, 2014, 2016, 2017 and 2018 he was also named Top 100 Lawyer in Ohio. From 2013 through 2018 he was named Top 50 Cincinnati Lawyer. 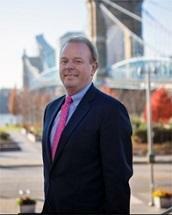 Mr. McCartney was also selected for the Super Lawyers Business Edition, Litigation (2012-2013). In 2014 he was also named Top Rated Lawyers in Medical Malpractice Law, Martindale-Hubbell and American Lawyer Media. Mr. McCartney was also selected and listed as one of the Best Lawyers in America, Medical Malpractice Law - Defendants & Insurance Law from 2008 through 2014, 2017 and 2018. Mr. McCartney further enjoys an AV Preeminent rating with Martindale-Hubbell.